If I’ve learnt anything while doing the Seamless pledge, it’s that second-hand clothing is just as good as new, if not better. Most people who’ve been around the sewing blogosphere long enough for the likes of Wardrobe Refashion, New Dress a Day and Sew I Thought will know charity and second-hand shops are a godsend for anyone keeping an eye on their clothing consumption. It’s starting to become more and more mainstream as belts continue to tighten, with the likes of Marks and Spencer’s “shwopping campaign”, as Zoe wrote about on her blog recently, becoming de rigueur. I do most of my second-hand shopping at charity shops, being lucky enough to live around the corner from Albany Road in Cardiff, where some real treasures can be found on the numerous charity shops along the street. But charity shops are obviously a two-way thing and they rely on our old and unwanted clothing to keep going and keep raising money. Last year, 64 per cent of you told me you donate your old clothes to charity, but I also found charity shops are struggling somewhat when it comes to donations. 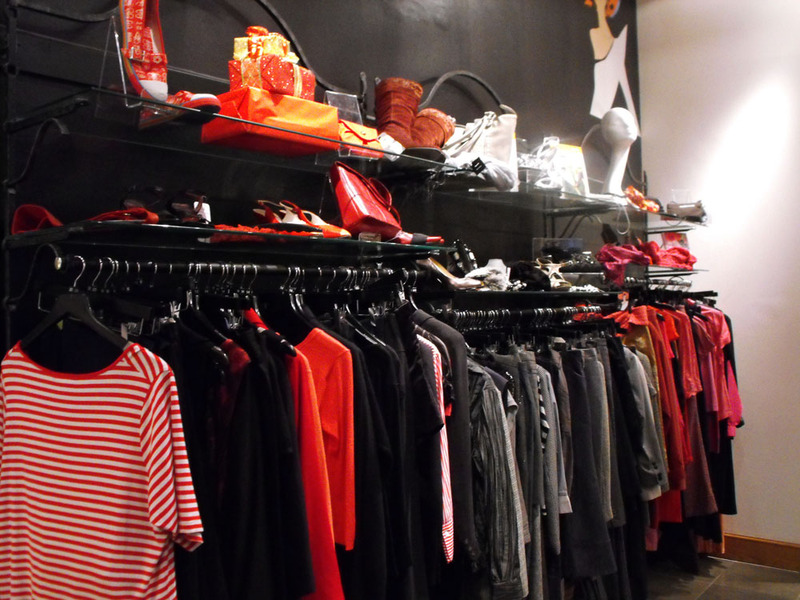 Hard times mean less shopping and fewer wardrobe clearouts. “Every single item donated to any one of our shops raises vital funds that enable us to support cancer patients and their families across Wales. Cancer Support Unit, bereavement counseling and keeping our freephone cancer support line open 7 days a week”. I don’t know about you, but I’d much, much rather be helping to make this extra £20 for a charity than contributing some extra pennies to a multi-national company. For the “Worn by You, Loved by Us” campaign, Tenovus set up a great little fashion shoot in Cardiff using clothing from their shops, modelled by staff from Tenovus. All the photos were taken by Amy Davies of Cardiff Arcades fame, so they’re pretty schnazzy to say the least, showing off second-hand clothing AND one of Cardiff’s amazing arcades. 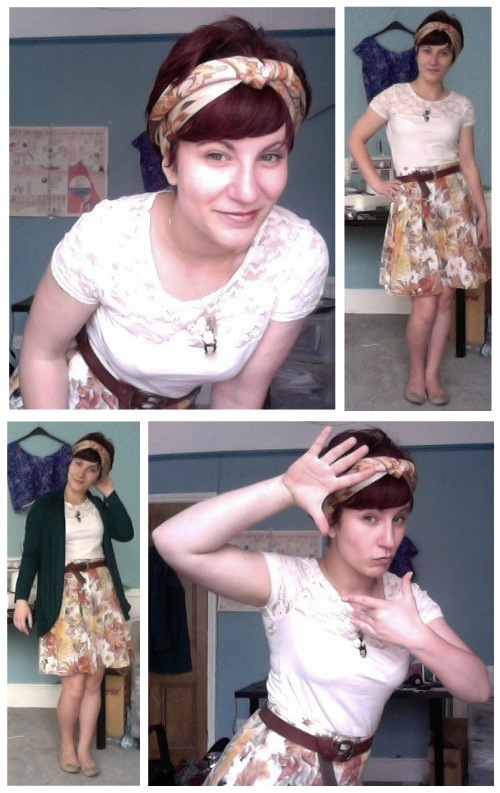 As it happens, Me Made May Day 24 happened to be all about the charity shops, as I donned my refashioned vintage skirt and skinny men’s belt for a day of exam mocks and revision. In fact, aside from the cardigan, my whole outfit had passed through other hands before they arrived in my wardrobe. The scarf is yet another vintage one from Lush, the necklace and my cream lace top were both birthday presents and my Mum bought me the shoes this time last year when she noticed how full of holes my favourite pair of pumps were. But here’s the fun bit – I was heading back from the Students’ Union when someone working for More! magazine stopped me to ask if they could take a photo of my outfit. For those of you who aren’t familiar with More!, it’s a fashion/celeb women’s magazine which is pretty popular over here. I won’t lie, it felt like a small victory to attract the attention of someone employed by a magazine with a direct interest in promoting fashion and the high street. Score one for second-hand fashion! I don’t have a particular favourite shop, but I haven’t bought any new clothes at all this year. I bought one skirt from a charity shop (a fiver for a Per Una skirt that appears unworn – bargainalicious) and my mum has passed on loads to me – I get first dibs on her stuff and then take what I don’t want to my local RSPCA shop. I do have a new Barnados shop near where I live (Southampton) and they sell everything for 99p. I haven’t had much luck with clothes, but duvet covers for muslins at 99p each is a great price. I tend to have better luck finding clothes for my husband in charity shops. He wears uniform during the week, but likes to wear a shirt with jeans at the weekend – nice quality shirts tend to be about a fiver each in charity shops, which is so much cheaper than I could make them (and I hate sewing for other people anyway). Kudos on getting your photo taken for a mag!